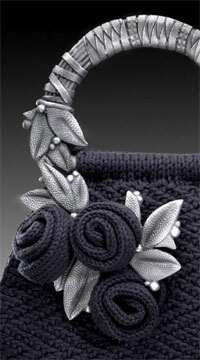 This purse is the first product of my collaboration with Lauren Abrams of LaBeana Bags. Lauren’s resin purse handles are a joy to work with—beautifully crafted and very sturdy. The pattern for the purse is a free download available below; purchase Lauren’s handles from the LaBeana Bags Etsy shop. Purchase the purse handles from the LaBeana Bags Etsy shop. Take the time to check gauge before beginning to make sure the finished purse will fit the handles. The purse itself can be knit by a beginner, but the blocking and seaming may require more advanced skills; you will be using mattress stitch to graft a curved bind-off edge to another curved bind-off edge and both pieces are patterned. Where do you get the leaves to add to the bag? Or do you have a pattern for them also? Lauren used to sell them in her Etsy shop as a kit with the purse handles, but they are no longer generally available. It looks like she has made them as custom orders for people in the past, so it may be worth contacting her via her Etsy shop to see if she can make you a set. 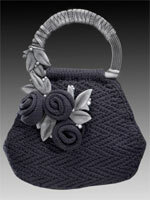 I’ve tried to find the Sliver purse handles on this page Saturday Night: Purse Knitting Pattern on Labeana site you have posted there is no purse wares for this name. She is no longer on etsy.com where else can I find these handles. Help! Please see my reply to MrsMommaD above. Many, many thanks to those who have donated in support of my fledgling pattern-design efforts. Your generosity is greatly appreciated!